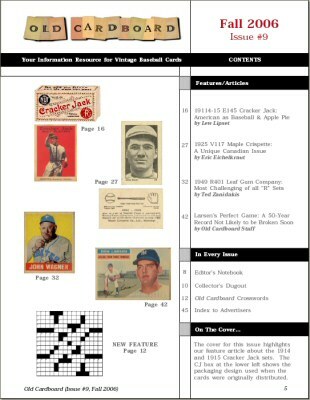 The cover and the table of contents for Issue #9 are shown below. 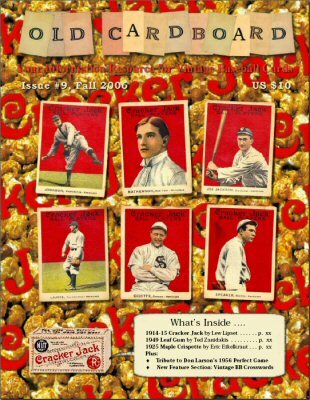 1) "1914 & 1915 E145 Cracker Jack: American as Baseball & Apple Pie" by Lew Lipset. 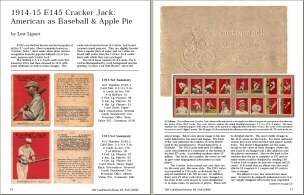 Hobby stalwart Lipset expands on his landmark Encyclopedia of Baseball Cards in an article that includes a full 172-card image gallery of the 1915 "superset" and an image of the scarce album described in the premium offer on the backs of all 1915 CJ cards. 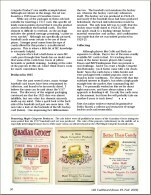 Also added is a backgrounder on the company that produced the famous brand. 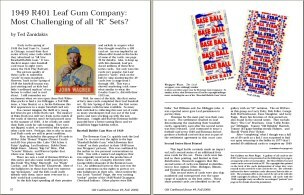 2) "1949 R401 Leaf Gum Company: Most Challenging of all 'R' Sets?" by Ted Zanidakis. A detailed description of this well known set written by a collector that started his set when the cards were first released. 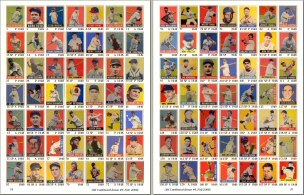 While some in the past have dated the set as 1948 or 1948-49, Zanidakis makes a strong case that all of its cards were distributed in 1949. 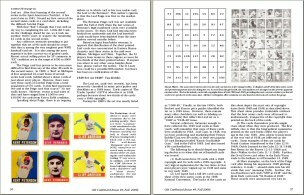 Includes a full set gallery, image of a full "1st series" sheet and much more. 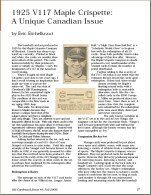 3) "1925 V117 Maple Crispette: A Unique Canadian Issue," by Eric Eichelkraut. The ins and outs of this relatively obscure Canadian set is explained in detail. 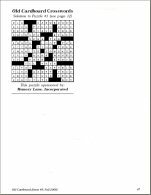 Also presented is the author's convincing argument that the set was originally produced in 1925--not 1923 as indicated in most hobby checklists. 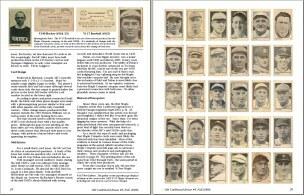 Article features a full set gallery including an image of ultrarare card #15--the only known example that features Casey Stengel. 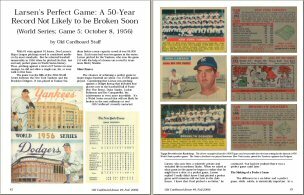 4) "Larsen’s Perfect Game: A 50-Year Record Not Likely to be Broken Soon" by Old Cardboard Staff. 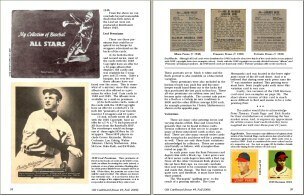 Setting: October 8, 1956, Game 5 of the World Series between the Yankees and the Dodgers. 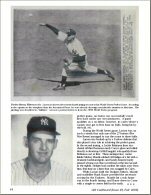 A tribute to Yankee pitcher Don Larsen who, fifty years ago this month, pitched the first, last and only Perfect Game in World Series history. Odds predict that the record will not likely be broken in the next millenia or so. 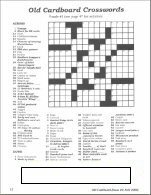 5) "Old Cardboard Vintage Baseball Crosswords" prepared by Old Cardboard Staff. 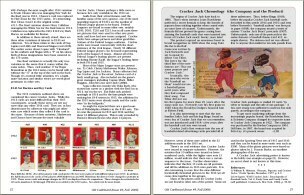 Launched for the first time in this issue, this new feature provides vintage baseball trivia in a challenging and professionally designed crossword puzzle format. 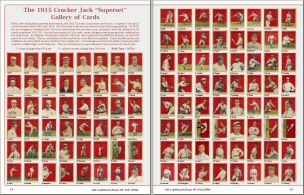 Approximately one-third to one-half of the words and clues in each puzzle relate directly to the vintage card collecting hobby. Solution provided in the back of the book (no cheating, please). 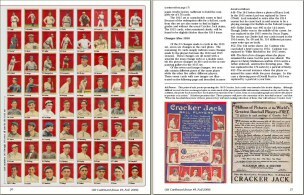 In addition to the above articles and new crossword feature, this issue includes the regular Editor's Notebook and Collector's Dugout sections, informative messages from our sponsors, and more.